Cakes Today is an online Eggless cake shop in London. We offer handmade Personalised Custom Novelty Cakes for Birthday, Cream Cakes, Fruit Cakes, Chocolate Cakes, Iced Cakes, Nut Cakes, Cupcakes, and Cheese cakes. As online same day cake delivery specialists we bake, make, decorate and deliver Kids Cake, Romantic Cakes, Sports Cakes, Corporate Cakes and Wedding Cakes. All of our cakes can be personalised in many ways, from size and shape to colour, and we will happily add cake toppers to make your event extra-special. Whether topped edible characters or plastic toys and figurines, our hand-decorated cakes will bring joy to any gathering long before anyone starts eating. We truly believe there's no cake that we can't bake - the wilder the request, the more fun we have making it! From birthdays and anniversaries to corporate functions, we can make masterpieces for every budget, design idea, and flavour preferences you could possibly have. Once the cake is baked, we go to work hand-decorating and designing your edible work of art, with an eye for detail and design that will leave you with a cake which looks almost too good to eat - almost being the key word. As always, we take pride in our work, and hand-deliver it so that it's as fresh as possible. Our same-day cake delivery policy also means that you can order and receive a hand-delivered cake without leaving the comfort of your own home, all while knowing that your cake will be as fresh and delicious as it ought to be. I will definitely recommend Cakes Today to friends and colleagues. Thanks for helping me to organize a birthday cake for my daughter on her birthday. Raveena who helped me with the order and organizing the delivery was very helpful, provided me with good options to choose/select from and finalize the order. This was all done very quickly and the cake was delivered on time as requested. I wanted to thank Cakes Today for helping me organize things for a special occasion. I will definitely recommend Cakes Today to friends and colleagues. Ben was a great help during the process of ordering my nephew's 5th birthday... He made it very simple and easy for me to order and the cake has the image my nephew wanted... The cake was delicious and highly spec... I will continue using their services as I have too many nieces and nephews I lost counting LOL. I received a Christmas cake and the cake was very nicely presented and packaged and was greatly enjoyed by me and my friends. would definitely recommend an order again. I would highly recommend this cake company The ingredients was fresh .Excellent customer service. Avery Beautiful well presented birthday cake I was delighted And would definitely use this company again..
Great tasting cakes. Fast delivery. Never let us down. Its our goto place for a cake for every occasion. Great service and cakes delivered on time. Impeccable service and gorgeous cakes! Have ordered from you 3 times now and will do so again. Thanks! Delicious cake slices and cup cakes. Super fast delivery. Many thanks. Well pleased .. thank you it put a massive smile on my lovely friends face after the first bite it was well freash thank you very much my cake shop from now on. It was a great experience. The driver was very prompt with my instructions. I would definitely recommend. The cake was presented beautifully. The taste of the sponge was very nice. The cake was amazing. We loved everything about it. The decoration the taste the colors. It was perfect. Thank you so much! Great service and great cake. Great Service! Fresh tastey cakes. I recommend Cakes Today to anyone. Tasted great! Thank you for a wonderful cake! Very professional and punctual. Telephone order was delivered with all the requests fulfilled and on time. Amazing delicious cakes, fast delivery high quality. Their Cake was freshly baked and tasted amazing! Everyone loved the cake and even asked for the name. 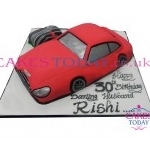 Cakes Today is a traditional, family-run British cake bakery brought into the 21st century. Our family's long history in the bakery trade has left us with recipes handed down for generations, which we now use to make delicious cakes for same-day delivery.